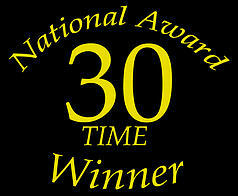 Peter Salerno Inc. Celebrates 30 National Design Awards Since 2002 – Design Your Lifestyle. Celebrate Peter Salerno Inc.’s Award-Winning Design With Us! With their 2015 Regional Design award from the Sub-Zero and Wolf Design Contest, Peter Salerno Inc. has earned a remarkable 30 national design awards since 2002. Peter Salerno Inc. was already blessed to be the most award-winning custom kitchen and bath design firm in North America over the last 15 years, and it is truly an honor to be a 30-time design award winner. The greatest reward any designer can receive, of course, is the joy his or her clients experience living in their newly-designed space. Still, it is quite a wonderful feeling for Peter Salerno and his hard-working staff to be recognized for their custom kitchen and bath designs in such an extraordinary way. On behalf of Peter Salerno Inc., Peter’s team and family, a very special “thank you” goes out to all those who have recognized their design work over the years, and blessings and happiness to the clients who have made all these custom kitchen and bath designs possible!